Louis VIII, King of France, eldest son of Philip Augustus and of Isabella of Hainaut, was born in Paris on the 5th of September 1187. Louis was short, thin, pale-faced, with studious tastes, cold and placid temper, sober and chaste in his life. He left the reputation of a saint, but was also a warrior prince. In 1213 he led the campaign against Ferrand, count of Flanders; in 1214, while Philip Augustus was winning the victory of Bouvines, he held John of England in check, and was victorious at La Roche-aux-Moines. In the autumn of 1215 Louis received from a group of English barons, headed by Geoffrey de Mandeville, a request to "pluck them out of the hand of this tyrant" (John). Some 7000 French knights were sent over to England during the winter and two more contingents followed, but it was only after twenty-four English hostages had arrived in Paris that Louis himself prepared to invade England. The expedition was forbidden by the papal legate, but Louis set out from Calais on the 20th and landed at Stonor on the 22nd of May 1216. In three months he had obtained a strong foothold in eastern England, and in the end of July he laid siege to Dover, while part of his army besieged Windsor with a view to securing the safety of London. The pretexts on which he claimed the English crown were set down in a memorandum drawn up by French lawyers in 1215. These claims -- that John had forfeited the crown by the murder of his nephew, Arthur of Brittany, and that the English barons had the right to dispose of the vacant throne -- lost their plausibility on the death of King John and the accession of his infant son as King Henry III in October 1216. The papal legate, Gualo, who had forbidden the enterprise, had arrived in England at the same time as Louis. He excommunicated the French troops and the English rebels, and Henry III found a valiant defender in William Marshal, Earl of Pembroke. After the "Fair of Lincoln", in which his army was defeated, Louis was compelled to resign his pretensions, though by a secret article of the treaty of Lambeth (September 1217) he secured a small war indemnity. Louis had assisted Simon de Montfort in his war against the Albigenses in 1215, and after his return to France he again joined the crusade. With Simon's son and successor, Amauri de Montfort, he directed the brutal massacre which followed the capture of Marmande. 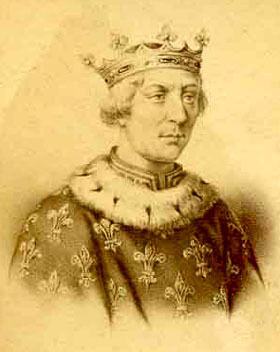 Philippe II, suspicious of his son until the close of his life, took precautions to assure his obedience, narrowly watched his administration in Artois, which Louis held from his mother Isabella, and, contrary to the custom of the kings of France, did not associate his son with him by having him crowned. Philip Augustus dying on the 14th of July 1223, Louis VIII was anointed at Reims on the 6th of August following. He surrounded himself with councillors whom his father had chosen and formed, and continued his father's policy. His reign was taken up with two great designs: to destroy the power of the Plantagenets, and to conquer the heretical south of France. An expedition conquered Poitou and Saintonge (1224); in 1226 he led the crusade against the Albigenses in the south, forced Avignon to capitulate and received the submission of Languedoc. While passing the Auvergne on his return to Paris, he was stricken with dysentery, and died at Montpensier on the 8th of November 1226. His reign, short as it was, brought gains both to the royal domains and to the power of the crown over the feudal lords. He had married in 1200 Blanche of Castile, daughter of Alphonos IX of Castile and granddaughter of Henry II of England, who bore him twelve children; his eldest surviving son was his successor, Louis IX.